Farmed seafood is becoming increasingly common even though it is just as bad as feed lot beef. Factory farmed salmon live in crowded, dirty pens which create a perfect environment for rampant disease and infection among the fish. To combat this, the salmon are treated with a cocktail of chemicals and antibiotics. Additionally, because they are fed a commercially prepared diet of grains (full of GMOs) instead of their natural diet of krill and other ocean organisms, they also must be fed chemical dyes to give their flesh the expected orange/pink hue instead of the pale gray color it has when farmed. Just like with grass fed beef, wild-caught Alaskan salmon taste superior to their factory farmed counterparts. When an animal grows naturally and in the environment it was designed to live in, it becomes the best it can be. When salmon eat their natural diet and swim freely in the oceans, their flesh provides the best tasting meat possible – no surprise there! 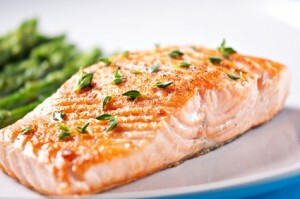 The American Heart Association recommends eating at least 7 ounces of fatty fish – like salmon – per week. Why? Because it contains healthy Omega3 fatty acids and helps us humans maintain a healthy balance between Omega3-Omega6 fatty acids. We cannot create these fatty acids ourselves, we must consume them in our food. Farmed salmon do not contain this preferred balance of fatty acids because they are fed grains. The consumption of grains by the farmed salmon increases their level of Omega6 fatty acids which most humans already get way too much of. You can read more details about the nutritional properties of wild-caught vs. factory farmed salmon here. This entry was written by Jeff, posted on March 6, 2014 at 9:18 pm, filed under Blog, Wild Caught Salmon and tagged Alaskan, caught, farmed, healthy, salmon, wild, wild-caught. Bookmark the permalink. Follow any comments here with the RSS feed for this post. Both comments and trackbacks are currently closed.